I set the action SUPER light on this 2006 Dean ML with .09 Ernie Ball guitar strings, then hit the down beat with my glass finger!!! I burned it up on these super light gauge strings – Drop d tuning with the sixth string soo loooooose it was dripping with tone!!!!! Took some SUPER light touch with the left hand but I’m getting the hang of it! I’ve owned and operated Wayne’s World Music since 1996. 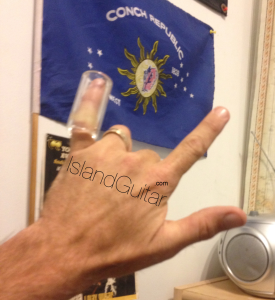 Previous Postanother picture of the Custom Silver Spoon Slide @ Island Guitar & Ukulele Music Lesson Studio in Key WestNext PostLes Paul string change & set up today then some Tube Screamer effects pedal fun! !